For fantasy baseball owners it is officially baseball season. Fantasy Baseball Junkies are searching every nook and cranny of the internet searching for the best information, the best software (you're choosing Diamond Draft, right? ), the best magazines, and of course the best books. Some of these also appeared in the Ultimate Fantasy Baseball Gift List. I'm always trying to be helpful so I put together this list of my favorite fantasy baseball books. They aren't all new but they are all useful and good reading. The Bill James Handbook is the original guide to projecting and analyzing player performance. Every season i learn something new from this book. It could be that Jason Giambi, despite his bulk, is actually a great base runner. Or it could be that Bobby Abreu despite his speed is a lousy outfielder. If nothing else James deserves your support for helping make the statistical study of baseball what it is today. As Bill James is to actual baseball, Ron Shandler and his Baseball Forecaster is to fantasy baseball. No one has helped fantasy leaguers win more than Shandler and the guys from Baseball HQ. From his unique game strategies such as the LIMA Plan and Portfolio 3, to his DOM/DIS listings, and scarily accurate player analysis. I feel naked without it (you don't want to see that). Fantasy Land by Sam Walker is a great book. It doesn't give you any real fantasy baseball information, at least not the type that you bring with you on draft day. But it does express some of what we all love about this game. That competitive drive to win. The decision making process during the season. 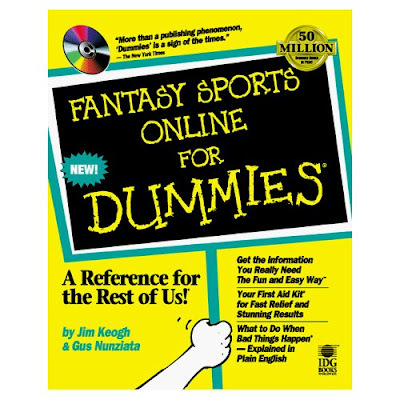 It also describes a dream for all fantasy leaguers - playing in the ultimate fantasy league, Tout Wars. How to Value Players for Rotisserie Baseball is the original manual to creating your own fantasy baseball auction values. Art McGee applies concepts from economics, finance, and statistics to develop a pricing method that far surpasses any other published. His method is highly sophisticated, yet McGee explains it in terms that any fantasy baseball owner can understand and apply. The Minor League Baseball Analyst is a companion book to Baseball HQ's Forecaster. Deric McKamey does for minor leaguers what Ron Shandler does for the major leaguers. I love having a few different prospect manuals so I can compare and contrast the scouting reports with the statistical profiles. Last but by no means least is Peter Golenbock's How to Win at Rotisserie Baseball. I love this book. I re-read it often. The advice isn't profound and it won't actually help you win but it might help you love rotisserie baseball just a little bit more (as if you needed the help). Plus, since it's out of print you can buy it via Amazon.com for about 64 cents. You can't beat that with a stick. Hi, thanks for all the information, just wondering where I get more details on shandler's portfolio 3? thank you. You can find more on Portfolio 3 at baseballhq.com, which is Ron Shandler's website.